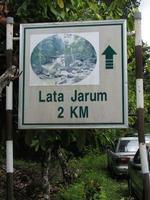 Lata Jarum is located a few km outside Kg Ulu Dong. In the nineties this kampung became (in)famous overnight when an ambitious and superstitious politician was murdered here by a bomoh. 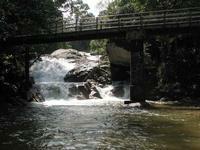 To reach this fall you take the road from Raub to Kuala Lipis. After about 10 km, at Dong, you turn right to Ulu Dong. 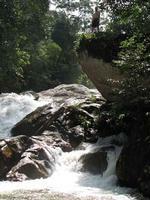 The country road passes several attractive kampungs. From Ulu Dong a small signposted road leads in 2 km to the waterfall. There must have been attempts to develop this fall. But apparently they failed. 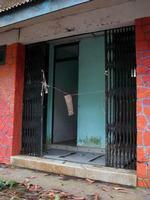 A new toilet building is unfinished , the old toilets are closed. 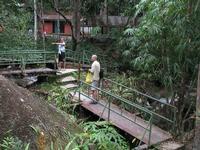 A bridge and walkways have been constructed across the stream, but need maintenance. Walkways make the access to the fall easy. Purists could discuss if this is a waterfall or a big cascade..:-) But the flow of water is impressive and the general impression is pleasant. 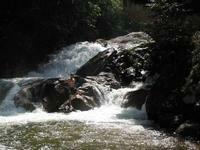 There is a huge pool and there are places for swimming, wading and picnicing. 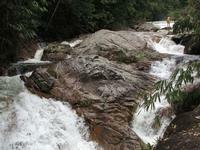 just visited this waterfall today....they are upgrading the facilities around the area and toilet too. 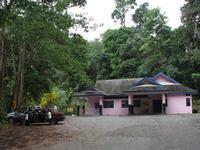 Lata Jarum can be nice despite the atrocious facilities. The falls and pool are refreshing. Take a camera and walk the trails upriver ... lots of trees, insects and other shots. Been here mid of 2007. 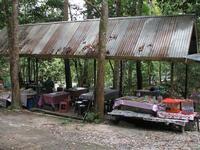 Nice place but public facility not upgraded especially the toilet.